Excitement or suspense for the next week as this loss by Skerries drags them into the relegation/ play off zone with only 2 points separating Skerries and Galway Corinthians. It was a game Skerries needed to take some points but ended their home fixtures with a loss to a very determined UCC side who themselves were striving to make the play offs for Division 1B. Throughout this campaign, Skerries have been forced to make changes with each match and this one was no different. Ciaran Frawley was unavailable as he was selected to play for Ireland U-19s next week. Derek Keane was out too and Conal Keane which meant a reshuffle of the back line. Robbie Jenkinson and Billy Mulcahy started at 9 and 10 respectively. Paul Devitt came into the wing position and Eddie O’Mahony returning to number 11. The Sherlock brothers AJ and Evan returning to the pack. UCC started the first half with a stiff crosswind at their backs. Within 5 minutes, the UCC centre Paul Kiernan cut through the Skerries defence and set up the opening score by which was converted by Tom Clifford. Skerries regrouped and went about putting some phases together. Strong UCC defence stopped Sherries from making headway. After a long delay due to a leg injury with one of the UCC players, UCC were awarded a penalty which stretched their lead to 10-0. Skerries did have opportunities to score but stout defence and dropped pass kept them at bay. With 3 minutes before half time UCC scored their second try which was converted to leave the half time score 17-0 to UCC. Skerries came out in the second half and played with better energy. Ross Dempsey retired injured and was replaced by Maurice McCauley. Colin Doyle moved to centre. A second injury to Paul Devitt meant Eoghan Carron came into number 9 and Robbie Jenkinson moving to the wing. The disruption did not help Skerries cause. To Skerries credit they continued to put phases together and were unlucky not to reduce the deficit. Skerries were finally rewarded with a well worked try by Ross McAuley, the difficult conversion was just short which left the score 17-5 to UCC. Skerries kept trying to breach the UCC defence but sometimes persistent infringement at the offside line which was not picked up by the referee frustrated Skerries chances of a score. With five minutes to go, UCC scored a third try. From the resulting restart, UCC moved the ball wide and scored their fourth try under the post to leave the final score 32-5 to UCC. For Skerries Ross McAuley put in his usual abrasive efforts while the young half backs of Robbie Jenkinson and Billy Mulcahy showed maturity and kept Skerries going forward along with the efforts from the rest of the team. While it was a disappointing end to the match, it did not reflect the effort put in by the young Skerries side. 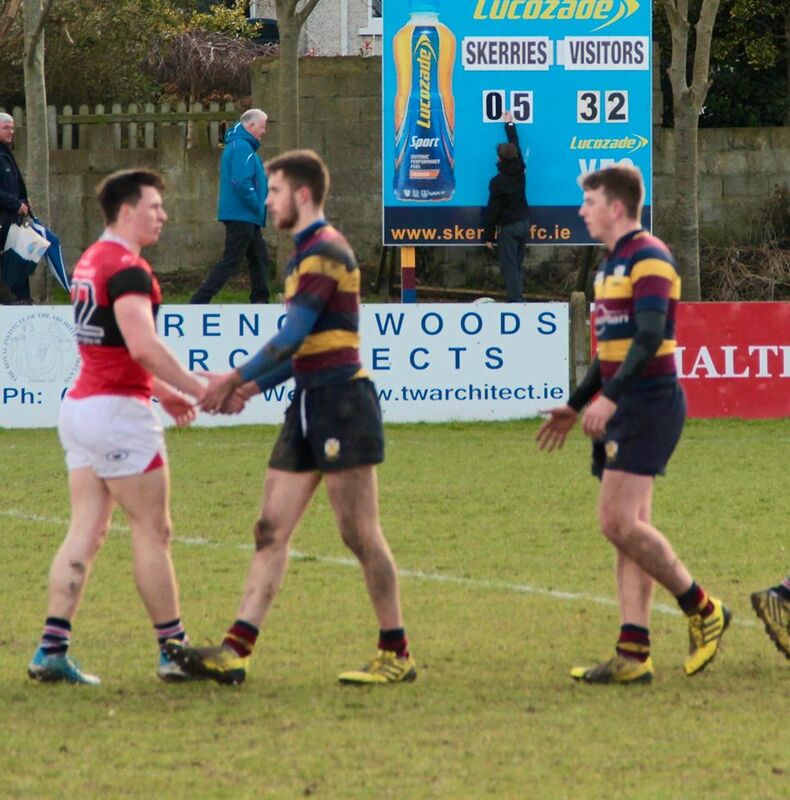 Skerries need to regroup and be positive for next weeks clash with fellow Leinster team Naas. Naas are top of the division and will be looking for the win for automatic promotion. The medical team for Skerries will be busy to make sure all players will be available for this final league match. The club acknowledges the support of everyone and looks forward to a large travelling support to encourage the players and management for this final encounter.